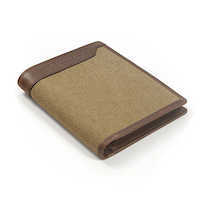 This rugged RFID Wallet with leather and canvas exterior and full leather interior has 7 card slots, including 2 netted ID windows with thumb notch. You’ll find plenty of room for cards, receipts, etc. in the 3 additional larger pockets behind the credit card slots. These men's RFID wallets are flexible for a comfortable fit in your pants pocket. The double billfold area is also RFID shielded. Dust, water, and stain resistant. This RFID blocking leather and canvas wallet has a Secure by Design Police Approval Specification for Identity Fraud Protection.